A 3-5 minute film featuring the Museum of Culpeper History! The Mission of the Museum of Culpeper History is to actively promote an awareness of history for residents and visitors through education, interpretation, presentation and preservation. The Museum of Culpeper History (MCH) is a state-of-the-art facility dedicated to three goals; to attract … to engage … and to educate. 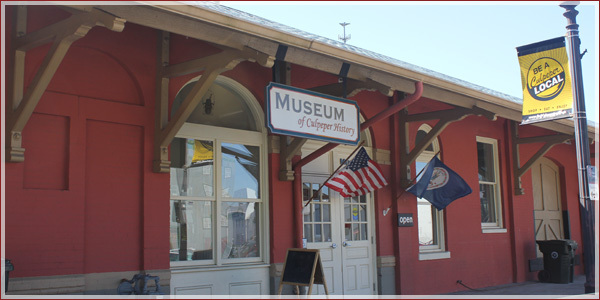 The purpose of the Museum of Culpeper History is primarily to collect, preserve and exhibit significant artifacts and memorabilia reflecting the people, places and events that continue to shape the character of Culpeper and the surrounding area. Collaterally, the Museum will serve as a resource for students of all ages to research and explore history, geography, math and economics, as well as provide an interactive resource and program-oriented organization boosting tourism and the local economy. Culpeper’s history is rich and diverse with the potential of becoming a powerful resource for education, economic development and an enhanced quality of life and community pride. The Museum has built a remarkable facility that honors and preserves the memorabilia and memories of its people, places and events – those that have shaped the destiny of this rural Virginia region. To stop there, however, could relegate the museum to mediocrity, just another small museum displaying an interesting assortment of artifacts. A state-of-the-art exhibit plan, creative programming and an aggressive marketing plan, enables the Museum to attract, engage and educate, thus establishing an unparalleled experience without comparison in a 100 mile radius. Visitors have called MCH “a mini-Smithsonian” because of its exhibitions, interactives and programming. Home of Eppa Rixey, pitcher for the Cincinnati Reds and a member of the Baseball Hall of Fame, and Pete Hill – TWO baseball Hall of Famers! Farmland under successful cultivation for more than 250 years. The list goes on, but the message is clear… Culpeper is brimming with historical attributes. Furthermore, a discussion of the natural assets, strategic location and economic vitality of the town and county is yet another story for another day. Visitations currently average about 12,000 per year, representing every state and to date 36 countries.